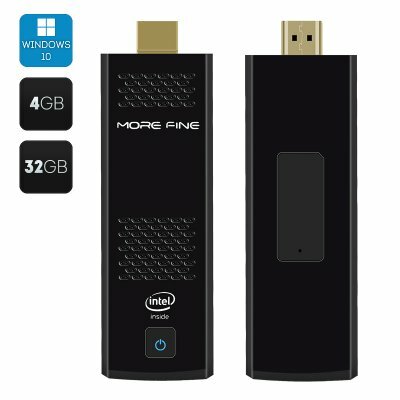 Successfully Added Morefine M1S Mini Pocket PC - Cherry Trail CPU, 4GB RAM, Intel 8 Graphics, USB3.0, Fan, Windows 10, 128GB External Storage to your Shopping Cart. Miniaturization brings forth the age of pocket computers and Morefine have just released their latest example of pocket PC excellences with the Morefine MS1. This powerful mini PC features an Intel Z8300 Cherry Trail quad core CPU and 4GB of RAM. With its built in cooling fan the Morefine MS1 remains cool even under the most demanding processing tasks meaning you can make the most of that burst technology and get a full PC performance form the Morefine mini PC. Intel 8th Gen graphics and the 1.84HGz processing speeds as well as 4GB RAM mean this PC stick can easily handle games and media as well as support all your productivity needs. Measuring just 111 by 38 by 13mm this mini PC stick is one of the most compact around and at only 65grams its ideal those who desire the specs of a fully fledged computer but don't want to content with the weight of carrying one around all day. With USB 2.0 and USB 3.0 ports you can connect all the usual suspects such as mice, keyboards, memory pens, cameras, scanners and plenty more so. You also have Bluetooth 4.0 and wireless connectivity so there's no shortage of compatibility and support for your peripherals. With a trial version of the Windows 10 OS preinstalled this HDMI PC stick can turn almost any screen into a computer in seconds. brining all the productivity software you could require Windows 10 has everything you need to satisfy your computing needs as well as plenty of options for media and entertainment. The perfect smart PC addition to any home, office or workspace you can enjoy a smarter home, work or leaning environment that won't take up valuable space and can easily be packed away or taken wherever you need. Simple plug in the MoreFine M1S into the HDMI port on your TV or projector and connect your peripherals via wired or wireless connections to have a PC where you want. The Morefine M1S 10 PC dongle comes with 12 months warranty. Brought to you by the leader in electronic devices as well as wholesale Mini PC Sticks and TV Dongles.. This product comes with a trial version of Windows 10 OS preinstalled, to obtain an full version of the software contact Microsoft. As a wholesaler, Chinavasion provides no software support, advice, or training regarding the operating system and software.